Kelly Florentia was born and bred in north London, where she continues to live with her husband Joe. HER SECRET (2018) is her third novel and the sequel to NO WAY BACK (2017). Kelly has always enjoyed writing and was a bit of a poet when she was younger. Before penning her debut The Magic Touch, relaunched with a new print-run in 2019, she wrote short stories for women’s magazines. To Tell a Tale or Two… is a collection of her short tales. In January 2017, her keen interest in health and fitness led to the release of Smooth Operator – a collection of twenty of her favourite smoothie recipes. 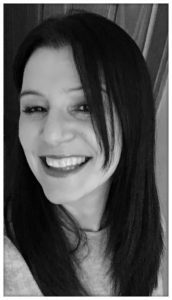 As well as writing, Kelly enjoys reading, running, drinking coffee, scoffing cakes, watching TV dramas and spending way too much time on social media. She is currently working on her fourth novel. Today I’m super-excited to welcome writer Kelly Florentia to my blog. Her novels include No Way Back and Her Secret, starring the inimitable Audrey Fox; her delicious short story collection To Tell a Tale or Two and her standalone novel The Magic Touch. BH: Hi Kelly, thank you for joining me today. It’s no secret that I’m a huge Audrey Fox fan and I’m not alone. Can I kick off by asking if we’ll hear more from Auds in the future? KF: Hi Bev, thank you so much for inviting me on your fabulous blog. I’m thrilled to hear you’re a big Foxy fan! Quite a few people have asked me if there are any plans for a third Audrey book. It isn’t something I’m thinking about at the moment, but I do think that Audrey’s still got a lot to give. So, watch this space. BH: Kelly, I live in hope! Okay, let’s talk about The Magic Touch. I’ve just finished my copy and I absolutely loved it. But in your own words and without giving too much away, what can readers expect? KF: The Magic Touch is a romance with a sprinkling of the supernatural. Emma King, who’s reluctant to marry a second time, despite endless proposals from her lovely partner Harry, starts to doubt the strength of their relationship when she discovers a string of flirty texts on his phone. Of course, Harry denies everything, but Emma’s not convinced. 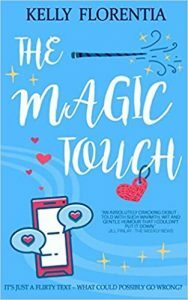 Determined to find out who the other woman is, she sets off on a mission to unravel the truth with the aid of her best friend, her elderly neighbour, and her sister-in-law’s app, The Magic Touch. The story is quite light-hearted and has been described as a laugh-out-loud rom-com, but it does touch on some serious issues, including death, domestic violence, and health concerns. BH: Congratulations on the reviews, Kelly; a straight five-star Amazon rating is phenomenal – you must be over the moon. Why do you think the book has struck a chord with readers? KF: Yes, I’m absolutely delighted, the response has been amazing. I think it’s struck a chord with readers because it’s so relatable, and Emma is a very down-to-earth heroine. She has flaws and fears and makes mistakes. But I also think that people like the supernatural aspect of the story. Sometimes it’s nice to escape into a mysterious and intriguing world where a little bit of magic happens. BH: Who or what inspired the idea for The Magic Touch? KF: In a nutshell, it was mobile phone applications. I was intrigued by how much we rely on them – from keeping us entertained to booking a restaurant etc. Being a runner, I actually use several weather apps to plan my weekly runs. There seems to be an app for everything these days. So, I was sitting in front of the T.V. one night with my husband, marvelling at a new app I’d just downloaded when I turned to him and said, ‘What if there was an app that could predict your future, but with alarming accuracy?’ And The Magic Touch was born. Of course, I had to create a story around the app. I took a common scenario, discovering flirtatious texts on your partner’s phone, and combined it with people who were in a long-term relationship but unwilling to tie the knot. I was particularly curious about men who were eager to get married because usually it’s the other way around. So I did a bit of research and my story unfolded. BH: Kelly, you’ve amassed an impressive collection of published work. How and when did you begin writing seriously? KF: I’ve always enjoyed writing. I used to write poetry when I was younger and still have some of my poems stuffed in a drawer somewhere. But I suppose I started to take it a bit more seriously when I began writing and selling short stories to magazines. The stories were a success and the feedback was good. One thing that readers kept telling me was that they didn’t want them to end. So I thought I’d have a try at writing a full-length novel and the rest, as they say, is history. BH: AM or PM? Tell me about your writing routine. KF: Whilst I haven’t got a strict routine, I do most of my writing before 2pm, with intermittent social media breaks! I write at my desktop in my office but I edit anywhere, even in bed sometimes. Once I’ve got the first draft done, I work on subsequent drafts on paper, often over a few cups of good coffee in local cafe. BH: What are you working on at the moment? KF: A psychological thriller. It’s about a thirty-something divorcee who, on the spur of the moment, makes a wrong decision involving her best friend’s husband and ends up in a very tight spot, which has a detrimental impact on her life and those she loves. It’s about friendship, trust, and instinct, and features a hot, fit gardener. Also, look out for Emma and her in-laws from The Magic Touch, they make an appearance in this one, too! BH: Any tips for fledgling writers just starting out? KF: Firstly, get that first draft done. Don’t wait for the perfect moment because it may never come. You can work on fine tuning and perfecting your novel in subsequent drafts. I do about three drafts, sometimes four. Do make sure you read a lot and try to write every day, even if it’s just a few hundred words. If the genre of your book is romance, sign up to the RNA New Writer’s Scheme. I did! Hook up with other authors online, they will support you on good days and bad, believe me. When you’ve finished your book, or even before, get a beta reader or a friend to read it for you; and make sure it’s someone who will give you an honest appraisal. I admit, no one likes to have their work criticised, but sometimes we can overlook things, mainly because we know the story and the characters so well, plus your own typos are hard to spot! A beta reader can point things out that you may have missed, or tell you if the story is working or not. And finally, don’t let rejection bite! I know it’s disheartening but it’s all part of the process. BH: Brilliant advice, Kelly. Thanks so much for all your insight today and for talking about The Magic Touch.